On their own, these roles are relatively straightforward. It’s the need to do all of them at once that complicates her life, Bal says. The place Bal needs to be right now is the bus stop, and she’s running late. It’s 7:30 a.m. as she hustles up the sloped street to the idling shuttle bus that transports her to UCSF’s medical campus. On the bus, Bal reflects on raising a family while climbing the academic ladder. Her field of expertise — child development — makes her hypersensitive to Annelise’s every move, muddying the distinction between work and family life. “There’s this feeling in the first year of your child’s life when you’re on the edge of your seat, waiting, watching,” she says, referring to the long list of milestones she knows all too well. Morning mayhem: Vanessa Bal’s daughter, Annelise, feeds the family’s dog a treat before heading to daycare. As the shuttle slows to a stop in front of the Sandler Neurosciences Center, Bal scrolls through a calendar app on her iPhone that her husband built for her. The tool displays her workday as a pie chart, with color-coded slices indicating appointments or tasks. Red denotes clinic time, blue is for research, green for meetings and yellow for writing manuscripts or grants. Today, as with most days, there is little white, which indicates breaks. Bal seems energized by the challenge as she excitedly describes the tasks ahead. At 8:30 a.m., she breezes through the door of the sun-soaked suite she shares with fellow autism researchers Stephan Sanders and Matthew State. “She’s unbelievably smart and capable and determined,” says State, chair of psychiatry at UCSF. Switching gears: Bal presses pause on other tasks to map out a study on emotion. Once she finished the course, Bal returned to Lord’s lab for her Ph.D. At the time, Lord’s team was involved in a project to try and connect genetic data with behavioral traits in families that have a single child with autism. Bal helped the team identify descriptions in a child’s medical records that could help make those connections. “She gradually knew more about how to get information out of it than any of us,” says Lord. Thanks in part to Bal, the team uncovered new details about the behavioral effects of DNA deletions and duplications on chromosome 16, which have been linked to autism. When Lord left Michigan in 2011 to direct the Center for Autism and the Developing Brain at NewYork-Presbyterian Hospital, Bal assumed some of Lord’s responsibilities. 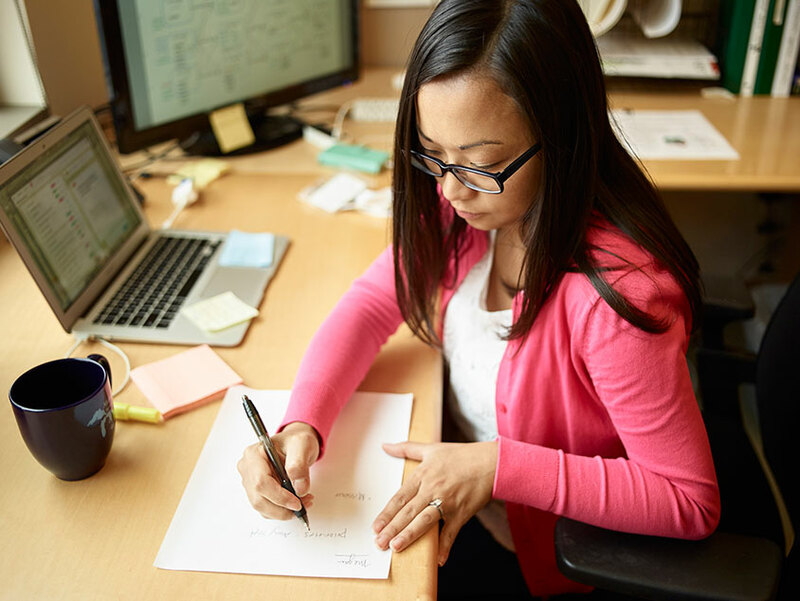 A second-year doctoral student at the time, Bal had to finish her dissertation while also tackling new teaching commitments and participating in conference calls with other researchers. By the time Bal finished her Ph.D. in 2014, Lord says, she had enough data to support two dissertations. It’s 2 p.m. and Bal is deep into a grant application that’s due in February. After devoting an intense couple of hours to the application, she changes gears and scrolls through an online cardiology tutorial. By 4 p.m., she has switched again, this time to shop for computer equipment for her new lab. What she hasn’t done is spend any time developing ideas for projects that she says have occurred to her throughout the afternoon. “I’m at a point in my career where I have more ideas than I’ve ever had, but I don’t necessarily have the time anymore to put them all down,” Bal says. 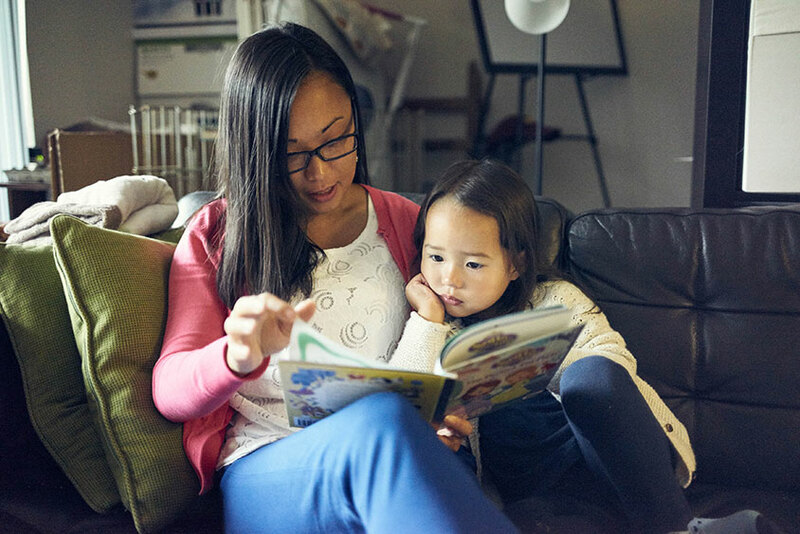 Story hour: Annelise often asks her parents to read one book … and then another. At 4:15 p.m. — a few hours earlier than usual because it’s the Friday before a holiday weekend — she packs up her laptop and heads home. The shuttle bus rumbles back across San Francisco, past old Victorians and canopied storefronts. Bal looks out the window, staring at tourists with cameras around their necks as they wander aimlessly along the steep streets. Apart from the times she has visited family in Michigan and attended academic conferences in Europe and Africa, she can’t recall when she was last on a vacation. “I guess it’s been a long time,” she says. It’s about 5 p.m. when the bus sputters to a stop in Bal’s neighborhood. She briskly walks home to pick up her bright green Subaru and drives to Annelise’s daycare. Along the way, she considers how different her life will be as a full-time faculty member. Bal’s plan is to spend about 20 percent of her time in the clinic and the remaining 80 percent doing research. 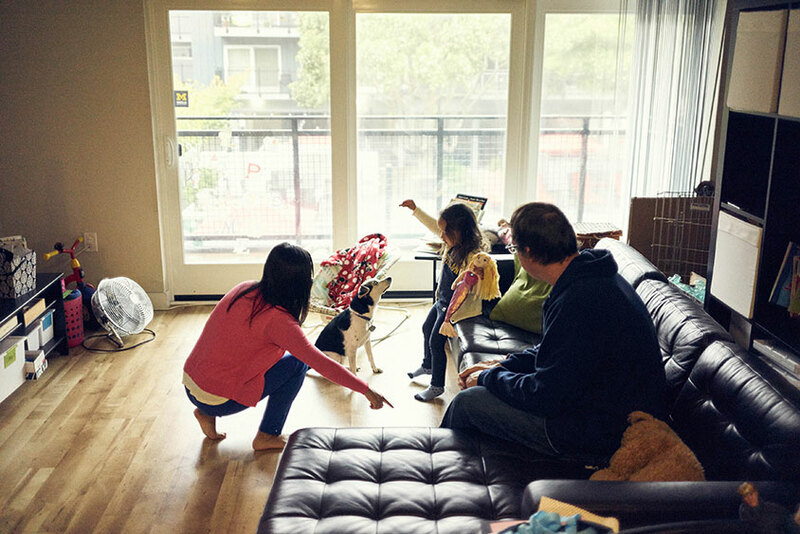 As a postdoctoral researcher, she often worked from home, but that’s no longer ideal. Bal says she’s excited to spend time in her new lab, where she can offer hands-on training to the next generation of autism researchers. At the same time, Bal says she feels a twinge when she misses an important moment in Annelise’s life, such as the time her husband asked the little girl about her day and Annelise strung several sentences into a story. After fetching Annelise from daycare, Bal sprints through the grocery store to pick up food for dinner. 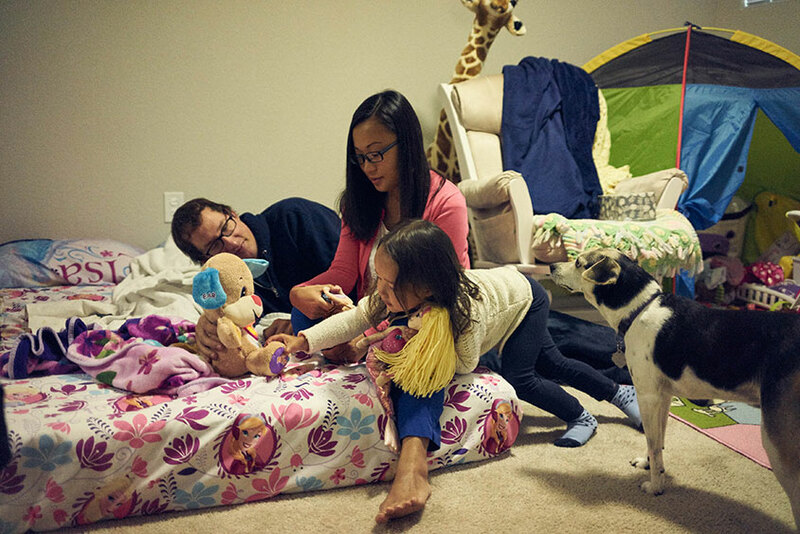 Around 6:30 p.m., the family squeezes in a trip to the park before Annelise goes to bed, usually around 8:30 p.m. Once she’s asleep, Bal and her husband work on their laptops, sometimes until after midnight. Day’s end: Bal and her husband sometimes work for hours after Annelise goes to bed. Motherhood has slowed Bal’s pace at work. Before pregnancy, she produced enough data to publish four to six papers per year. This year, she says, she’ll have just three. But she’s comfortable with the tradeoffs. Around midnight, Bal peeks through the doorway to Annelise’s bedroom. For a few moments, she watches her daughter sleep. Then she heads off to bed, where inspiration often strikes her. If she’s lucky, she’ll catch six full hours of sleep before her darling alarm wakes her up again. After this story ran, we discovered that the writer, Ann Griswold, has a personal conflict of interest with the STAR Center at the University of California, San Francisco. Vanessa Bal, who is the subject of the story, is affiliated with the center. We do not believe this alters the content or tone of the story. Nevertheless, we apologize for this oversight.